Steiff's Centennial edition of an exact replica of Dolly is limited to 1000 world wide. 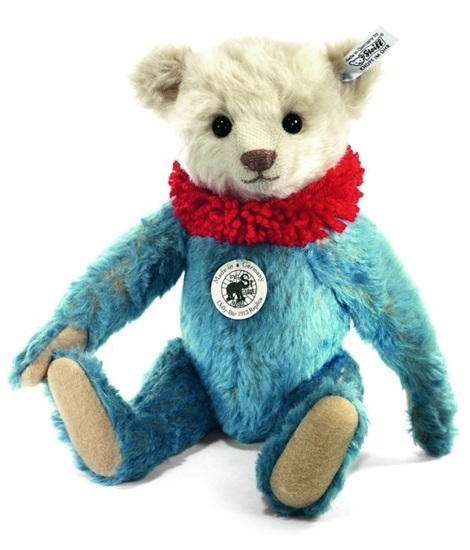 This is the centennial edition of Dolly Bear Replica introduced in 2013 and limited to only 1,000 pieces worldwide. She was originally introduced in 1913 for the U.S. Presidential elections, which explains her red, white and blue coloring. This Dolly is an exact replica of the original, with wood stuffing, blue and white mohair fur, and a pure new wool red collar around her neck. Made in Germany, Dolly is approximately 12 inches tall and has glass eyes and felt paw pads. She is 5-way jointed and has cinnamon yarn stitching for her nose, mouth and claws. If you squeeze Dolly, she will squeak.